The smart phones have flooded the market like never before. Besides making our life even more intelligent, these pocket-sized powerful devices have paved the way for the growth of many innovative technologies and expanded the spectrum of application of the existing one. Almost every pocket is likely to have one, and this was the factor that led to the development of the newest buzz “Mobile-Friendly website”, yes a full-fledged working site in your smartphones and tabs, be it aBlackberry or Samsung, iPhone or Sony it works as fine as on your laptop and desktop or you can say even better because of the portability. The actual website is scaled-down especially for mobile viewing with minor changes in the layout and exactly the same functionality (almost). In spite of being a miniature form of the giant site, their deployment and maintenance do cost some bucks consequently cutting down other expenses from the actual site budget. But the main issue is to see through clearly whether mobile sites justify their overhead by reducing the online marketing costs and Search Engine Optimization cost. Let’s see some perks of a mobile-friendly website and then decide. Yes, as new technology is coming up and constructive exploitation of internet as a resource is on full run we can expect exponential growth of smartphones and tablet user. With internet-enabled that too at a very affordable prices, a smartphone is virtually your laptop only with a smaller screen, so a why not a mobile-friendly website. An enormous amount is invested in online sales strategy, SEO firm, ORM, and others so as to make their name heard. As said earlier, every pocket is likely to having a smart phone, consequently everybody is on internet, so why not to introduce people your products there. Google Ads is an outstanding example; Google came up with the concept of pay per click so as to as reach out as many potential consumers of the products as possible. As mobile website’s journey embarked, the Google Ads crusade was further fueled resulting in a stiff increase in the brand values all around at lower cost comparatively. Being mobile which is the principal advantage, customers could access internet everywhere and henceforth likely to come across brands they are interested in, courtesy to free Wi-Fi zones and hot-spots. 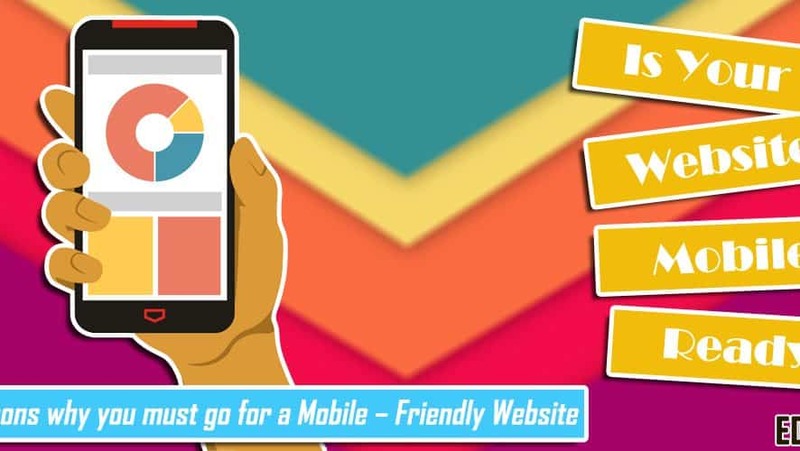 Mobile-Friendly Websites gives the online marketing brainer a clear view about the consumers response towards a product and their flaws that are supposed to be rectified, moreover it could work very well as or as a reference for requirement analysis for the actual website. These days, from biscuit to bride everything is available on internet, and mobile website is just dwindling that gap between product and consumers, for sure the growth of mobile sites is exponential and will be even more in near future. So scaling one’s sites to these pocket size powerful devices is surely a shrewd move. A mobile-friendly website is also called a responsive website, means it responds to the browser size of the devices it is being browsed on and adjusts the resolution accordingly to make itself readable and precise. We, at edata4you.com, offer a comprehensive website designing services in Delhi, so if you are looking for a mobile-friendly website to be developed, we can surely help you out. Please ask us as it won’t cost you anything and our suggestions can be helpful to you anyhow. Reduce your workload, go for Data Entry Outsourcing!